Modern Beauty Girl: Christmas Countdown Day 5: Holiday Hair Inspiration! Christmas Countdown Day 5: Holiday Hair Inspiration! So I was on pinterest the other day, because let's be honest, that's what I do in my spare time! And I saw some hair things that I think is perfect for the holidays and I wanted to share them with you in a inspiration type post! So let's get started! I love the effortless look of a side braid! I've been rocking it a lot lately and I think that this one is really cute with the mini fishtail going into the bigger one! 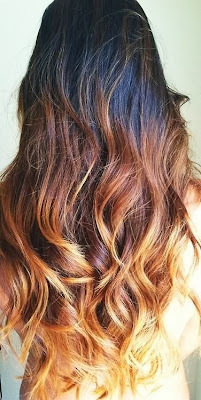 I've really been loving ombre lately, too and I am thinking about doing it to my hair, except that I'm really afraid of damaging my hair! And of course, the epitome of holiday hair! The bombshell side sweep! This is so gorgeous and looks absolutely stunning and I really want to try this out on myself, but I have no clue how to do it! Haha I'll be searching youtube videos on this soon! So thats my hair inspiration! Let me know yours in the comments and don't forget to follow this blog for more posts! Ahh i want to have ombre on my hair too, but I love my natural dark hair and don't want to damage it. I wish my hair look as good as the last one when I try to do it haha. :) Thanks for sharing. I love love love the bombshell side sweep! This is a great holiday hair inspiration post, just what I've been looking for! I've been wearing lots of braids lately too! Haha they're so easy and cute! thanks for the tips Laura! I'll be sure to try it soon!